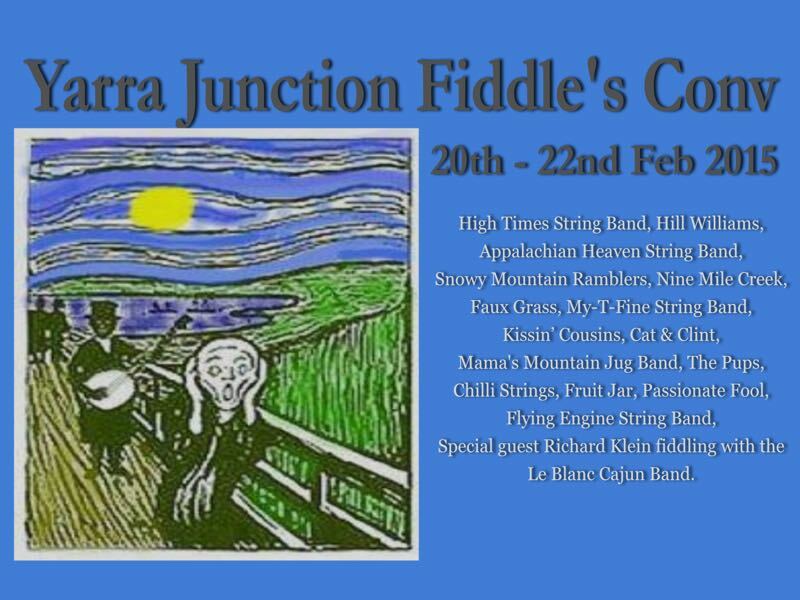 The 33rd Yarra Junction Fiddler’s Convention will be held from 20th to 22nd February, 2015 at Camp Eureka, Tarrango Rd, Yarra Junction, Victoria, Australia. Australia’s oldest and biggest old-time music festival for fans and players of String Band, bluegrass Cajun Old-Time Roots, Concerts, workshops, dances, fun, and of great sessions. Expected to play are High Times String Band, Hill Williams, , Appalachian Heaven String Band, Snowy Mountain Ramblers, Nine Mile Creek, Faux Grass, My-T-Fine String Band, Kissin’ Cousins, Cat & Clint, Mama’s Mountain Jug Band, The Pups, Chilli Strings, Fruit Jar, Passionate Fools and Flying Engine String Band, Special guest Richard Klein fiddling with the Le Blanc Cajun Band. Unpowered camping in 30 acres of beautiful bush, in a Heritage listed site. With a beautiful creek. Some (free) bunk-house spaces (contact Ken). Hot showers. Communal kitchen. Food van all weekend. $50 all weekend including cabins, bunkhouse or camping. All you need is a pillowcase and sleeping bag. Day tickets & concessions less. Under 18 free. Under-cover dance, concert & workshop areas. People start arriving on Thursday from 2.00 p.m., and we wake you up and throw the last of you out on Monday. One hour drive from Melbourne central via Lilydale. Regular suburban train & bus. Check us out on YouTube for lots of great videos of our concerts, dances, sessions and workshops. It’s definitely not just fiddles. Truth is we named it after the Galax Old Time Festival in Virginia. It is the longest running old-time and bluegrass festival.